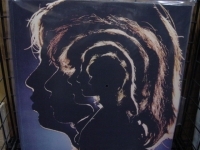 "The Rolling Stones, Hot Rocks (2 LPs)"
180 Gram Limited Edition DSD Remastered Virgin Vinyl. Seven years worth of the most influential and important songs from the band to that point (1972). One hears the band evolve from loud, R&B inspired rockers to trend-setters and rebel-poets all in one sitting over 21 killer tracks! Tracks Include: "Time Is on My Side" "Heart of Stone" "Play With Fire" "(I Can't Get No) Satisfaction" "As Tears Go By" "Get off of My Cloud" "Mother's Little Helper" "19th Nervous Breakdown" "Paint It, Black" "Under My Thumb" "Ruby Tuesday" "Let's Spend the Night Together" "Jumpin' Jack Flash" "Street Fighting Man" "Sympathy for the Devil" "Honky Tonk Women" "Gimme Shelter" "Midnight Rambler" "You Can't Always Get What You Want" "Brown Sugar" "Wild Horses"